For the CAD asset to be imported, the CadImporter plugin must be loaded. Limits the distance between triangles and the original surface. It is used to define triangulation of the imported model together with the Angular Deflection. Limits the angle between adjacent triangles generated from a surface. It is used to define triangulation of the imported model together with the Linear Deflection. Enables importing materials from the file. Materials are stored in the .step, .stp and .iges, .igs files. When importing, only the albedo (diffuse) color is copied. Other material parameters should be set up after the model is added to the scene. If multiple CAD models are imported together this feature does not guarantee that all materials with same names will be preserved, as only one prefix is used for all of them (if two models have different materials named black, only one of them shall remain with the specified prefix). To avoid such cases models should be imported sequentially with different prefixes. The default unit of length for CAD models can be millimeter, inch, etc. On model importing, it is transferred to meter used in UNIGINE. So, you may need to scale the model on importing to get the appropriate size. The specified value doesn't affect scale of the model added to the world. CAD model can be represented as a single detail or as an assembly. If parts of the assembly are stored in separate files, you should specify all of them on the assembly import. If the imported CAD asset stores a detail, a single static mesh will be a child of the dummy node. If the imported CAD asset stores an assembly, the dummy node will have a hierarchy of child nodes representing parts of the assembly. By default, the surfaces of each detail of the CAD model that have the same material are merged resulting in a single surface for each detail in most cases. 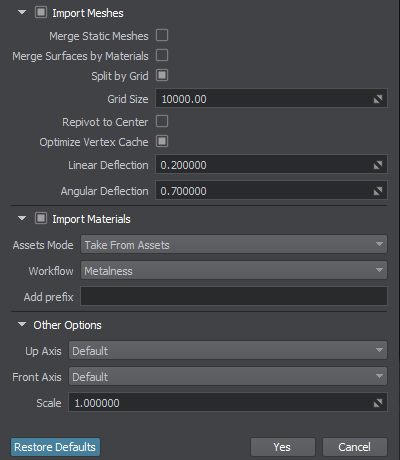 If you enable the Merge Static Meshes option, all child meshes will be combined into a single one. At that, all surfaces of child meshes will be copied to the single parent mesh and will appear in its Surfaces hierarchy. You can also merge the surfaces of the CAD model having the same material assigned by enabling the Merge Surfaces by Materials option. Usually, the unit of length of the CAD models differs from meters. When importing a model into UNIGINE, it is transferred to meters. It may lead to improper size of the imported model: to adjust the scale of the imported geometry, you can use the Scale parameter. A CAD model can also store materials assigned to surfaces of the details. To import materials from a CAD model, enable the Import Materials option. In this case, the surfaces of the imported model will have the corresponding materials assigned. Materials are usually stored in the .step, .stp and .iges, .igs files. On their importing, only the albedo (diffuse) color is copied. Other material parameters should be set up after the model is added to the scene. To add an imported CAD asset to the scene, drag it from the Asset Browser to the Viewport window. The corresponding node will be created and displayed in the World Hierarchy window. This node will have the same name as the imported CAD asset and a hierarchy of child nodes representing separate objects contained in the model. 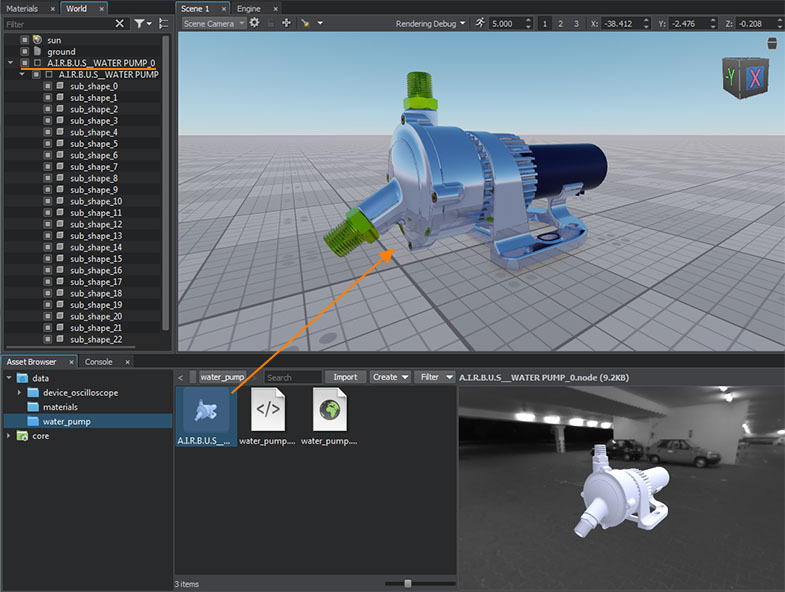 If you double-click the imported CAD asset in the Asset Browser, the .mesh and .node files generated in run-time and stored in the CAD container will be displayed.